One of the greatest joys in Jazz is the ability to follow an artist's career as both leader and sideman. A long time ago someone realised that what jazz fans want is to know who is playing on their records, so the personnel list became a staple of record sleeves that survives to this day. Close attention to the personnel of a record can allow the canny listener to pick out recordings by their favourite artists that they might otherwise have overlooked. So it is with this record, which was principally purchased on the strength of the presence of Bennie Maupin and Cecil McBee. Bennie, of course, went on to an illustrious career as a member of Herbie Hancock's Headhunters. Prior to this date he had also appeared in groups under the leadership of artists such as Marion Brown and Pharoah Sanders. Cecil McBee went on to play with Pharoah Sanders also, and was associated with Alice Coltrane on many of her finest recordings. The other players on this record are also excellent, although there is little for me to say about the previously unknown (to me) Nock and Marshall. This record is a real mixed bag, containing everything from post-bop to soul-jazz. Some might say that's not all that far, but just wait until you listen to this recording. The first thing to point out is that today's radio blog tune, 'Double Split', is GREAT though definitely not representative of the album as a whole. It's a cracking piece of soul jazz in the Jack McDuff/Jimmy McGriff vein that points towards Maupin's 70's funk leanings as much as anything. Elsewhere, 'Specific Gravity One' showcases Maupin on flute, and is presented in the style of mellow post-bop that is now associated with the ECM label. And if you think that's diverse, then check out 'J.C. Dudley', a stonking slice of straightahead bop taken at a furious tempo, that's a real showcase for Maupin's virtuosity on the tenor. Special mention must also be made for McBee, whose playing throughout is superb. The other recordings I own of his show him to have a remarkably clear bass sound, with a firm attack that many bassists cannot achieve. It's pleasing to hear this aspect of his sound present so clearly here. The Maupin-less 'Emotivations' is a fine example of his playing as well as that of Nock's - the two of them basically solo independently of one another, but in inhabiting the same harmonic areas never sound as if they're drifting apart. 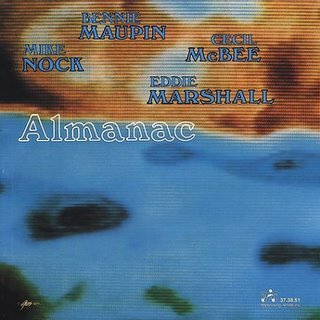 McBee is also excellent on 'Almanac', a Nock-led number with a furious walking bassline that's placed really high up in the mix. If you're at all interested, you can still buy this album on CD! Try here.